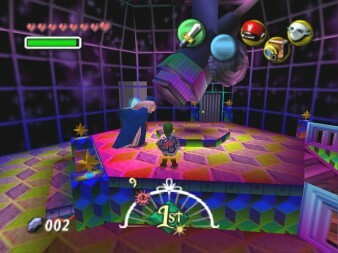 The Astral Observatory is a structure that is located on the South Eastern edge of Termina. From the outside it looks like a blue dome with constellations marked on it and a huge telescope coming out of the room. The inside has two floors, with the upper floor looking very "modern" in some sort of way. It is the home of the astronomer and professor named Shikashi, who is continuously gazing through his gigantic telescope looking at the heavens. Some other things to note about the observatory is the Moon's Tear that is on show on a small pedestal next to the professor. It one of the very rare meteorites that have fallen on Termina. The first cycle when Link enters Termina he needs to get a Moon Tear to trade it for the spot near the Clock Tower to make it to the top. Only thing is that he needs the Bubble Blast Magic and the Bomber's Secret Code to get through the cavern that leads to the back door of the observatory. Some other things that can be found in the observatory's basement are a cucco in a little cage (perhaps Shikashi's Meal) and a scarecrow. The scarecrow's name is Bonooru who gives you a hint to the two secret songs called Inverted Song of Time and the Song of Double Time. However you need an Ocarina first to get him to talk about it. The scarecrow can also dance to make time pass faster, if you want to end the current day and go on to the next. For more information about him see the "Bonooru" Entry. The Skull Kid is playing pranks on top of the Central tower in Clock Town. 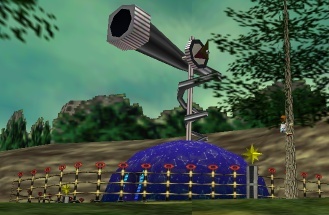 Taking a closer look at him causes a small cut-scene, in which a Moon Tear falls down near the Observatory. A waving man can be seen at some points of the day, on one of the pillars close to the entrance of Ikana for example. I haven't found any uses for him though. After giving the Moon Tear to the Deku Scrub, you can see that Deku Scrub flying out of Clock Town into a nearby hole. After watching him enter the hole you can get a Piece of Heart from him for 150 rupees, if you refuse to take it he will lower his price to 100 rupees. Try to lower it again and he will leave saying that you are a shrewd. know about that secret route..."
The secret route to the Astral Observatory has a small secret about it as well. If you have bombs or the Blast Mask take a left turn when you get to the underground water area. On the far left you can see a ledge with a cracked wall, blast it open to find a chest with a silver rupee (100 rupees) in it. This page was last modified on 10 January 2006, at 22:03.